Friendship Hearts are traditionally known as symbols of friendship and are given as gifts to express affection or love. As each one is handcrafted, no two are the same. The sunlight shines through the coloured glass which sparkles beautifully when hung inside windows, or outside in trees and arches as garden features. They make the perfect gift for loved ones on all occasions including Christmas, Birthdays, Valentine's Day, Bridesmaid Gifts, Friendship Gifts, Thank You Gifts, Leaving Gifts and Anniversary Gifts! 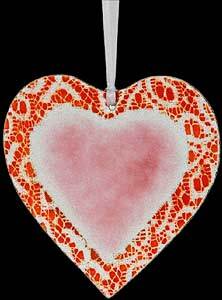 The Friendship Fused Heart is a beautiful handcrafted glass heart. A gift to celebrate friendship and love for that special person. Supplied boxed, with a white satin ribbon 60 x 0.5 cm (2' x ¼") and Friendship label.